Holy Moly we can’t believe it’s already been one year since we started. 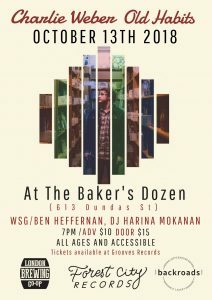 We can’t thank you enough for your continued support so come check out our next release at The Bakers Dozen on October 13th 2018. Charlie Weber will be releasing his full length debut album on vinyl and we have a couple other partners joining us to make this a special event! Tickets available here! Check out the single here! Way to go! Stand up! Be PROUD! Keep it going! Rock on!